UPDATED: Thu., June 1, 2017, 5:25 p.m.
What happened: Mark Reynolds and Nolan Arenado homered and the Colorado Rockies beat the Seattle Mariners 6-3 on Thursday, ending the M’s four-game win streak, to split an abbreviated two-game series at Safeco Field. To add injury to insult, Jean Segura left the game with a right ankle after a hard slide into second base, and Nelson Cruz left after taking a hit-by-pitch in the left hand. Mariners starting pitcher Yovani Gallardo was roughed up for five runs on six hits and three walks with just two strikeouts. Casey Lawrence took over for the ineffective Gallardo and gave the M’s five fairly impressive innings. He allowed one run on three hits and three walks, striking out nine, tying a career-high and setting an M’s record for a relief appearance. Guillermo Heredia hit a solo home run and Robinson Cano picked up a pair of base hits. After a scoreless first, Gallardo found it tough sledding in the second, giving up a four-spot. Carlos Gonzalez led off with a walk, then scored on Mark Reynolds’ 14th home run of the season to left-center field. Gerardo Parra followed with a ground-rule double, which prompted a visit to the mound. Ian Desmond sacrificed Parra to third, and he came in on Trevor Story’s line-drive single to left. Tony Wolters singled and Story went to third, then scored on Charlie Blackmon’s sacrifice fly to make it 4-0. The M’s got one of them back in the bottom half on a solo shot by Guillermo Heredia, his fourth. Nolan Arenado led off the third with a solo homer, his 13th of the season. Gallardo issued two walks and another base hit but managed to escape any more damage to the scoreboard. With one out in the third, Kyle Freeland hit Nelson Cruz on the left hand. After examination, he stayed in, but would leave for a pinch-hitter later in the game. In the fourth, Freeland hit both Ben Gamel and Carlos Ruiz to start the inning. Jean Segura grounded one up the middle and Story made a nice play to cut it off then make a backhand flip to force Ruiz at second. Danny Valencia followed with a sacrifice fly to left. Gamel scored, but Segura tried for second and was thrown out by the cut-off man, Arenado. Segura injured his right ankle on the hard slide ans was helped off the field. M’s caught a break in the seventh. 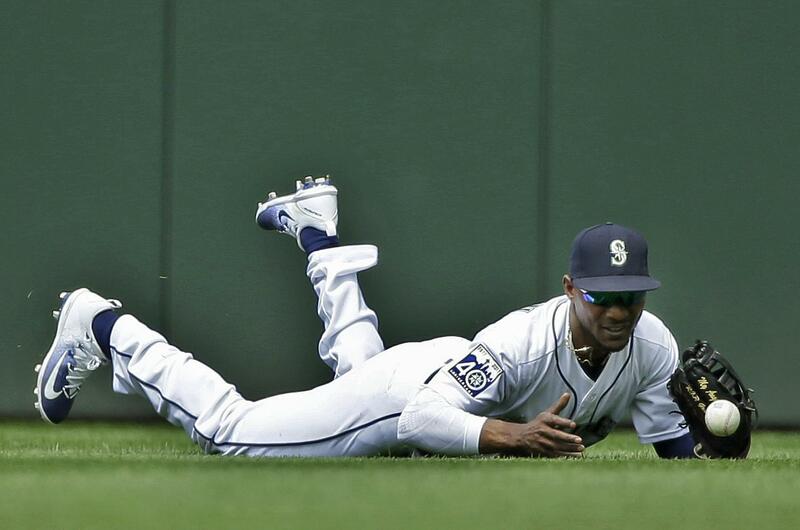 Jarrod Dyson made a diving attempt at Gerardo Parra’s sinking line drive. The ball popped out of his glove for a single, but Carlos Gonzalez broke for home. The throw was cut off, and after a brief rundown, Gonzalez was thrown out easily at home. In the bottom half, Dyson led off with a bunt single and went to second on a wild pitch by reliever Chris Rusin. He went to third on Valencia’s groundout to second, then Robinson Cano drew a walk. Boog Powell (in for Cruz) slashed one just inside the third base bag and Dyson trotted home to make it 6-3. But Kyle Seager popped up and Heredia struck out to end the rally. The win streak was going to have to end at some point. Gallardo was not very good, but Lawrence really kept them in it. The new injuries to Segura and Cruz bear watching though. Obviously they represent a huge part of the team’s offensive output. Hero: Casey Lawrence. Came into a 5-1 game and gave the M’s a fightin’ chance. Goat: Yovani Gallardo. Was the one that put them in the hole to begin with. ERA now astounding 6.24. The Mariners had at least 3 hit batsmen (Nelson Cruz, Ben Gamel, Carlos Ruiz) for the 21st time in club history (last: May 16, 2017). It’s the first time at least three different Mariners were hit by pitch in a single game since April 25, 2014 against Texas. The single-game club record is four HBP. Tampa Bay Rays (29-27) vs. Seattle Mariners (25-30) on Friday at 7:10 p.m. at Safeco Field. RHP Jake Odorizzi (3-2, 3.14) vs. RHP Christian Bergman (2-2, 4.67). The four-game winning streak went the way of the dinosaurs yesterday, mainly because Gallardo couldn’t get anyone out. But the injuries didn’t help – and may have long-term significance. The way Gallardo is throwing, he may not. … Lawrence did a nice job out of the bullpen. … The Rockies are back in first in the National League West. Published: June 1, 2017, 4:22 p.m. Updated: June 1, 2017, 5:25 p.m.